I didn’t buy an Instant Pot to make cake and honestly didn’t see the point since it takes just as long or longer than if you bake it in the oven. But after reading about how steam makes Instant Pot cakes extra moist (and being completely uninspired in the baking department this week) I decided to give Instant Pot Chocolate Cake a try. And it was good! Plus, even though the cooking time is the same or slightly longer than oven-baking, this particular cake is quick and easy due to the technique. 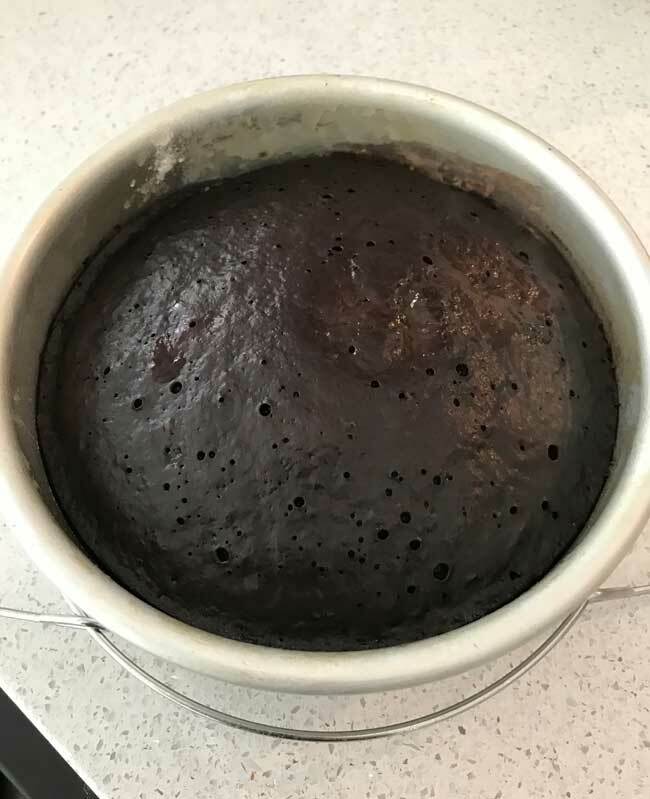 It’s a dump and stir cake similar to Chocolate Crazy Cake and requires absolutely zero skill and no mixer. You just mix the dry ingredients, stir in the milk mixture and pour it in the pan. Unfortunately the frosting does require a mixer. It’s my usual go-to chocolate frosting made with natural cocoa powder, but scaled down to 1/3 which is plenty. Of course if you want to skip the mixer altogether you could use a ganache frosting or a glaze, which I might try next time. 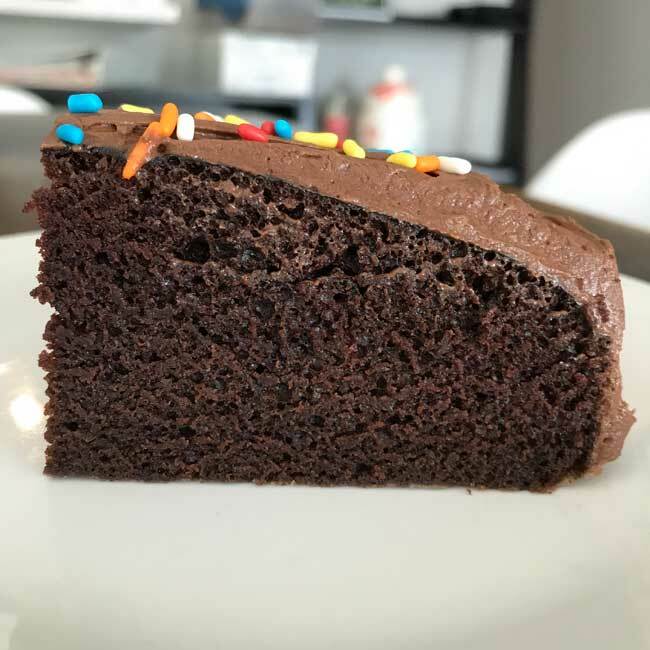 And there will definitely be a next time because I like the small size of the cake and just enjoyed the flow of the recipe and the fun of using the Instant Pot. Here’s the recipe if you want to give it a try. It’s based on a hazelnut version from Ivy Manning’s Instant Pot Italian book. She makes hers double this in an 8-inch springform pan and uses hazelnuts and Frangelico. I thought it was just fine without the nuts and liqueur. Another change I made was to just use regular milk, but the original version uses almond or soy milk and is totally vegan! Need a vegan cake? Just swap milks, use vegan butter for the frosting and remove the sour cream. 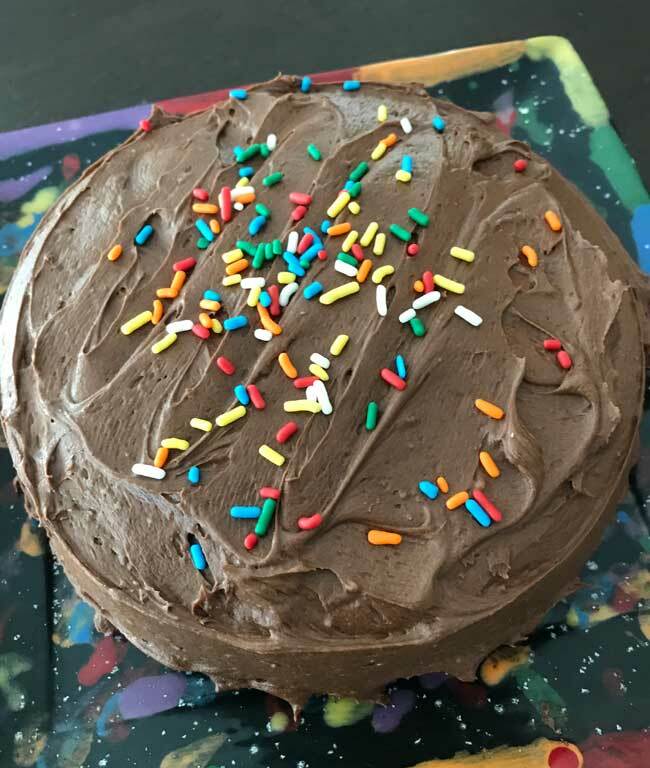 Six Inch Instant Pot Chocolate Cake plus easy frosting recipe. Grease and flour a 6 inch round cake pan. Set the trivet in the instant pot and add 1 ½ cups water. In a mixing bowl, whisk together flour, sugar, cocoa powder, baking powder, baking soda and salt. In a small bowl or in a 2 cup Pyrex measure, mix milk, oil and vanilla. Add the liquid mixture to flour mixture and stir by with a rubber scraper or mixing spoon until fully blended. Pour batter into the greased pan, set it on the trivet and close and seal instant pot. Make sure the steamer valve is sealed, then hit “manual” then set to 28 minutes, hit manual again. When the cake is done, release steamer nozzle (quick release), then remove lid and carefully remove the cake. It should look slightly glossy and have an internal temperature around or a little over 200F. Let the cake cool completely, then make chocolate frosting. Beat together softened butter and sugar, then stir in cocoa powder and sour cream. Beat in the milk and vanilla and continue beating until smooth and creamy. Add more milk if needed and add salt to taste. Stephanie, make sure you get two so that you can use them for 6 inch layer cakes. I’ve found that a lot of 9 inch layer cake recipes, when halved, make 6 inch cakes. I’m not sure how big your instant pot is, but the original recipe was double and called for an 8 inch springform, so I guess a lot of Instant Pot cake recipes also use 8 inch springforms. But I recommend the 6 inch pans because you’ll most likely find more uses for them. You are the only person that would get me to try a cake in the instant pot. Thanks for posting this. I just have to get a 6″ cake pan now. Carol, I haven’t tested this cake with skim but since the original used almond or soy I don’t see why skim milk wouldn’t work. Maybe to be on the safe side, add an extra teaspoon of oil? But really, it should work. In general, I prefer whole milk for baking but it really depends on the recipe. 2% almost always works, but skim might be too water. But I do think it would be fine here. Can you substitute skim ilk with the same results in baking this cake and in general? Fascinating! I’ve come close several times to getting an Instant Pot but then talk myself out of it. This looks like a fun cake to try. I had forgotten all about Frangelico until you mentioned skipping it here. Yum!